Meet Kevin the jeans bale. As you may have gathered from exploring this website, secondhand clothing arrives in Ghana in bales. Most of these bales are 55kg or 120lbs, but some can be as heavy as 200lbs. Each bale is packed by item type - men’s jeans, ladies’ tops, men’s suits, etc. The number of items per bale varies (based on weight and/or type of garment) from 40 items to 600, but our research shows that the average number of items per bale across garment type is 200. The price per bale is determined by three factors: weight or number of items, garment type and country of “origin” (where the clothing was collected). Our surveys show that bales can cost over 2,000 Ghana Cedi or roughly 400USD, with the average cost per bale being 750 Ghana Cedi or roughly $150 USD. Through surveys and anecdotal evidence we learned that bales coming from the USA and Canada tend to be cheapest because they are considered the lowest quality. Generally, bales from the UK are the most expensive. Fast forward…. When a retailer (someone who buys individual bales from a middle man or from an importer) receives her bale, the first thing she will do is cut it open (the bales come wrapped in plastic and wire) and sort the contents into 3-4 grades called ‘selections’. First selection is the best and includes items with price tags still intact (this could be the price tags from charity/secondhand shops in the global North such as Goodwill), deadstock from retailers/brands or lightly worn items that are trending or embellished. Our research suggests that first selection makes up an average of 18% of each bale. Second selection includes lightly worn items that are the appropriate size for the retailer’s market and in good condition. Second selection makes up an average of 30% of the bale. Third selection is anything that looks worn, is out of style, is damaged, is not the correct garment type or is the wrong size. Third selection makes up roughy 46% of each bale. The rest is considered fourth selection called ‘asei’ or trash and is usually thrown onto the ground to be sent directly to landfill. Retailers depend on first selection. First selection might be less than 20% in volume of the bale, but it is 70% of the value needed for retailers to payback the price of the bale. If bales do not have sufficient first selection, retailers stand to lose money. This is often the case. The value gained from second selection might help a retailer break even, but without sufficient first selection, rarely will retailers make a profit. Sometimes retailers hire “Selectors” who stay up on trends in order to help them determine which items belong in which selection. Within an hour of cutting a bale, retailers have a good sense of whether or not they will make their money back. This is stressful for retailers who are essentially gambling every time they purchase a bale. The selection process is also key to understanding how much of the clothing being sent to Ghana is actually being purchased and given ‘a second life’ versus how much of the clothing is being sent to landfill. While third selection is not immediately considered trash, roughly half of third selection is never sold and ends up in landfill or is otherwise unaccounted for with no financial value. In addition some of first and second selection will also go unsold and will be downgraded to third selection. In some cases some of second and third selection may be purchased (or given away) in bulk to be sent to a market in a neighboring country or in rural regions of Ghana. Yet despite this, our research shows that half of third selection will be sent to directly landfill. In most cases this will happen within a week of a bale arriving at Kantamanto. Through surveys conducted with 55 traders across garment types we found that on average 40% of every bale is either sent directly to landfill or otherwise unaccounted for financially, representing a significant lost value for traders and a significant burden for the City of Accra. The Accra Metropolitan Authority pays for 70 metric tons of clothing waste from Kantamanto to go to the Kpone Landfill in Tema six days a week (except holidays). 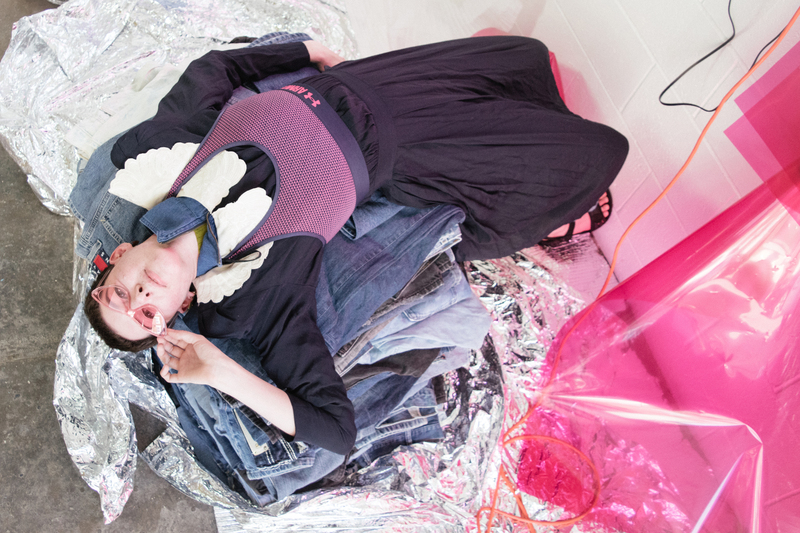 More clothing is sent to the dump and informal, illicit landfills through private trash companies, but those numbers are difficult to track down. This means that nearly half of the “used” clothing sent to Ghana to be reused is not being reused. This is a serious issue that deserves our attention. The material, environmental and social implications of this lost value have become the main focus of our research. This brings us back to Kevin. 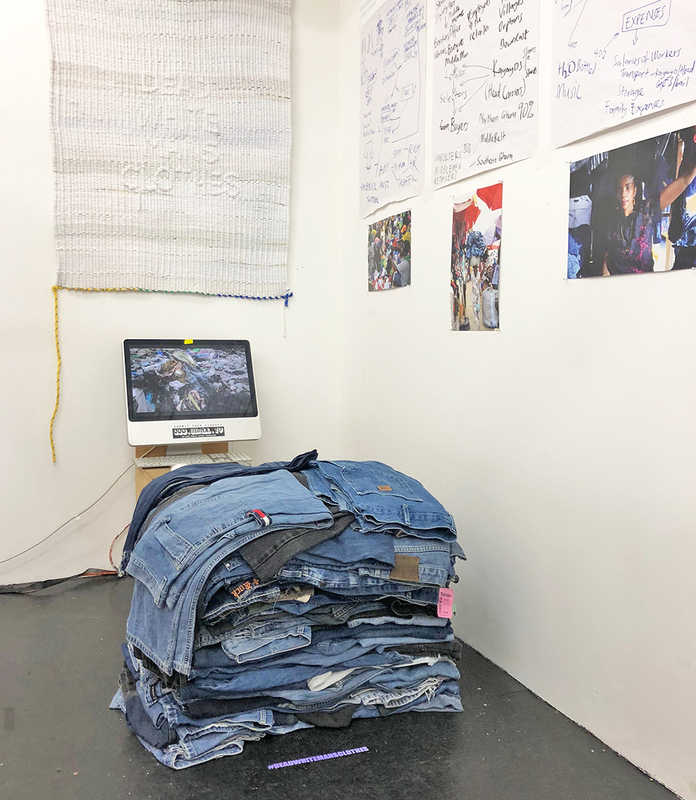 Kevin is a jeans bale that was baled and exported by a Canadian clothing collector, but the importer in Ghana told us that the majority of the jeans were bought and worn by Americans. 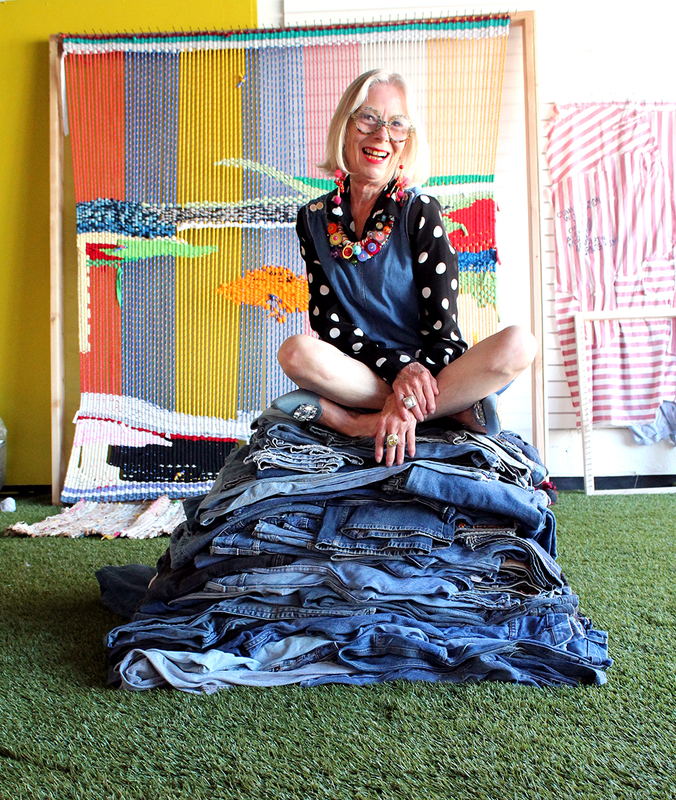 The jeans were donated or collected by an American clothing collector or charity before being shipped to Canada to be sorted and baled by a larger clothing collector. There are 103 pairs of jeans and the bale cost 400 Ghana Cedi or roughly 100USD at the time we purchased it (on the cheaper end). The bale is called ‘Kevin’ because the importer labeled his bales with the names of his children and our bale came with a label that read ‘New Kevin’. 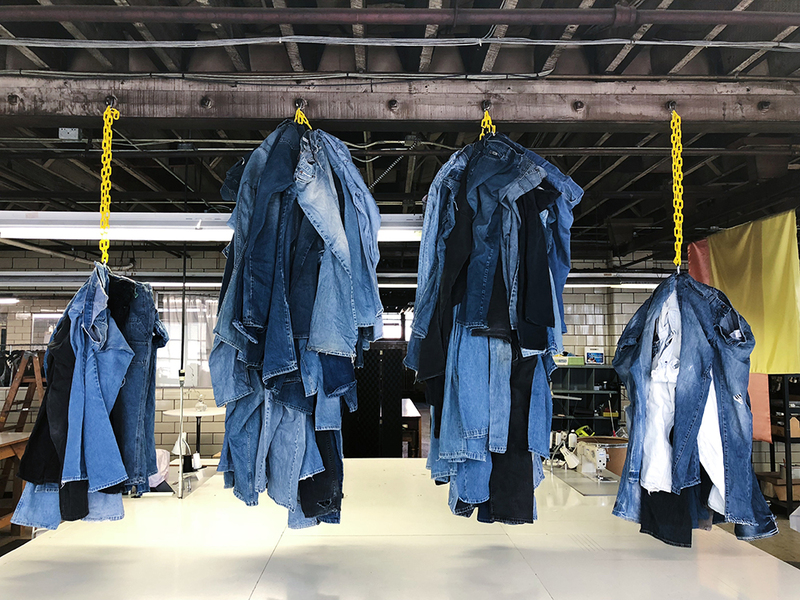 These 103 pairs of jeans were manufactured in 15 different countries and represent 52 brands, with the top three brands being Lee (17 pairs), Wrangler (8 pairs) and Levi’s (6 pairs). 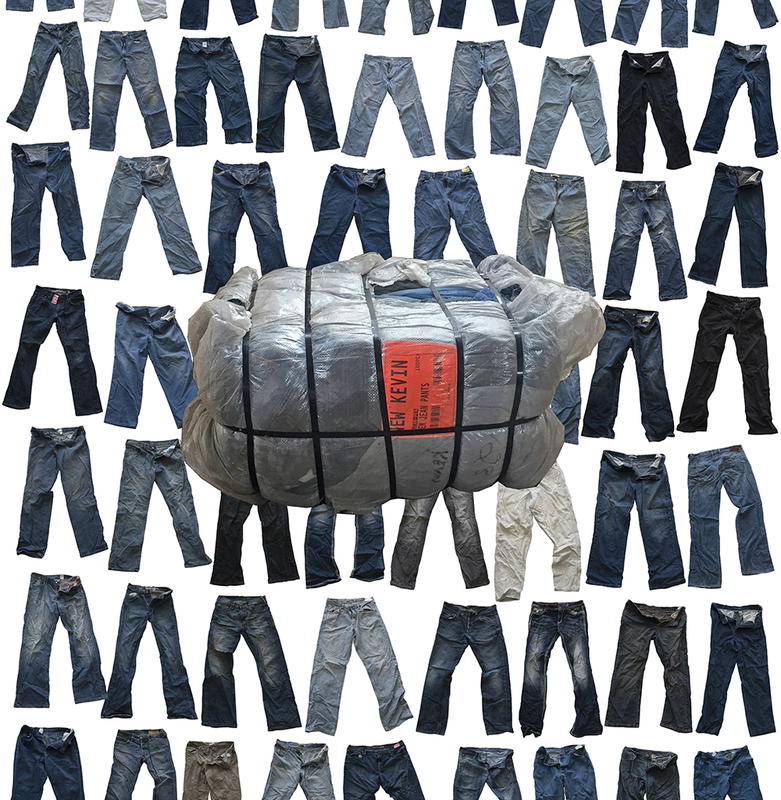 When calculating the miles traveled from each pair's country of manufacture to the USA, where these jeans were bought and worn, to Canada, where the bale was packed, to Ghana and back to the USA, where the bale currently resides, the contents of this bale have traveled roughly 1,343,288 miles. ...So why did we purchase Kevin? During our research we found it difficult to determine the attributes that make a garment first selection versus third selection. Does every trader use consistent criteria when sorting a bale into selections? If so, this data could be useful on multiple fronts. We decided to test for consistency. We bought a bale of men’s jeans and asked three retailers (all of whom sell men’s jeans in Kantamanto) to sort the same bale on camera and to explain their criteria in detail. Watch the three retailers - Solomon, Hajia, and Joyce - sort Kevin into selections (with sound) below. Scroll below to see pics of each pair and if you are super curious you can also check out this spreadsheet with further details on each garment. While there is some discrepancy between the retailers, we found that there was consistency in what was chosen as first selection. All three of the retailers said that Kevin was a ‘bad’ bale, as it would be impossible for them to make back the initial $100 that we had spent on the bale. Kevin now lives in the USA. 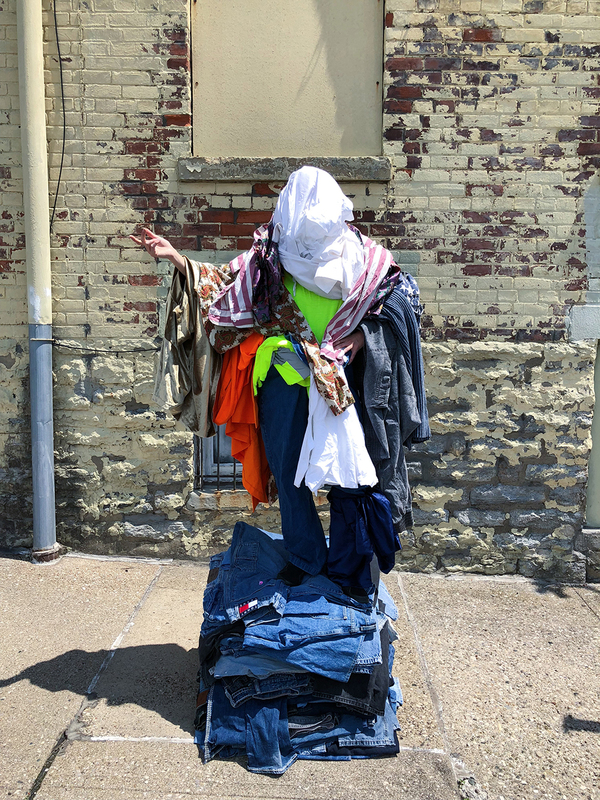 We have big plans for these jeans (plans that we hope will keep these jeans out of landfill), but for now Kevin serves as an artifact of our research. 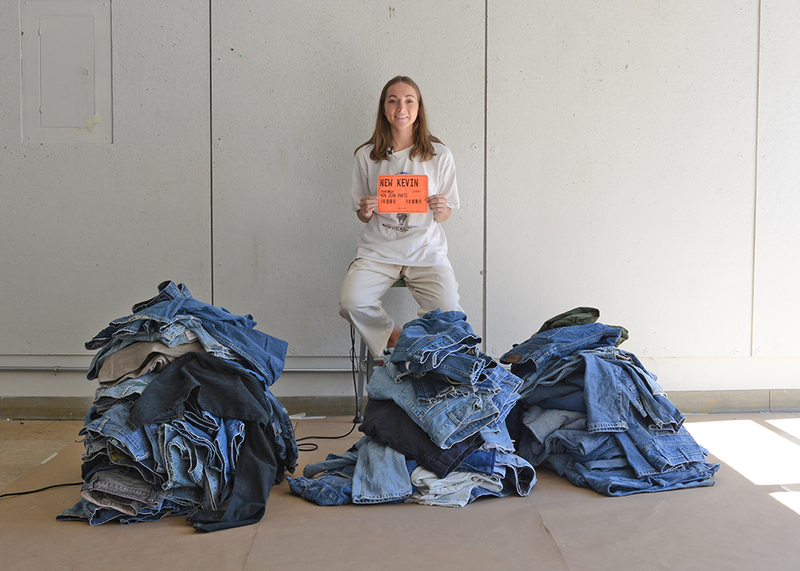 We are asking people in the USA to sort the bale, exploring how the jeans are valorized in different contexts. 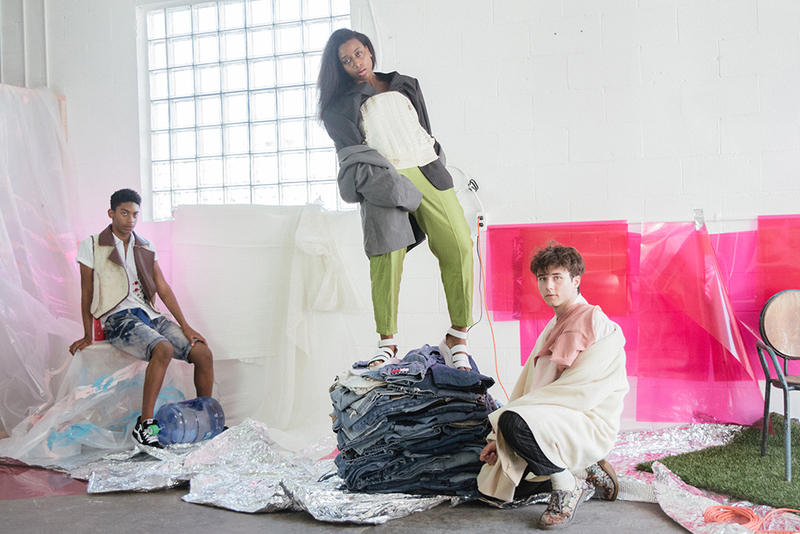 How might an emerging designer interested in upcycling assign value to these jeans? How might someone working for a USA-based clothing collector assign value? Kevin has also been used in several photoshoots, and Kevin travels as part of our Dead White Man’s Clothes exhibit.